Hot Trend This February, Spreading the Love! Ok. Before I even begin this post, I just want to say that to me, this blog is like a party. We keep the conversation light and it is considered poor form to discuss religion or politics. That being said, I don't think I'm alone in feeling like things have been a little bit tense in our world lately. A middle child by birth, I am naturally uncomfortable when all sides are not getting along. My inner peacemaker wants to have a bonfire at the beach and re-create a 70's Coca-Cola commercial. I'd like to buy the world a Coke. Even if I could afford to, I’d be too scared to even do THAT because what if people wanted Diet? Or Coke Zero? Or Pepsi? What can I do? If you're feeling at all like I am, we've landed in a good month: February. February traditionally has been given to Valentine's Day and Presidents. By the way, can we just take a second to talk about how there used to be two holidays around the presidents? We used to get a day off for Lincoln’s birthday and a day off for Washington’s birthday. It was a magical four-day weekend flanked by two four-day school weeks. Now we just have “President’s Day.” Who’s great idea was THAT?! What a rip off! But, I digress. Anyway, back to February and Valentine's Day. Some people equate Valentine’s Day with romance and having a boyfriend/ girlfriend/ husband/ wife or the absence of those significant others. I think of Valentine’s as more of a day of love and friendship. And, considering how things have been lately, I think we should deem it a whole month of SHOWING love and friendship, even if we don’t always agree. I’ve comprised a list of my favorite NICE THINGS you can do for your family, friends, neighbors and complete strangers. I know. This sounds really Mary Poppins of me. How is a list of Valentine’s ideas going to fix things? Well, it’s not. But, doing nice things for others may make life a little more pleasant during unpleasant times. Plus, I don’t know about you, but I get such intense delight when I surprise people with random stuff. Try these Nice Things! They may make YOU happy! Cut hearts out of felt and pin to anyone that needs a Valentine pin! Of course, I used my Cricut for this one! Lay felt on a strong grip mat. With the cut setting on “Fabric,” I used the free-cut heart shape and cut a series of 2” hearts. Attach to a friend, loved one or someone who in need of Valentine adornment. I “felt” my dog was in need. She disagreed. Remember giving valentines to everyone in the class? Why don't we do that anymore???? Pass out candy and cards at work. C’mon – it’s fun! Make a crazy wreath and hang it on your neighbor’s door! I found this glittery wreath at my local dollar store. 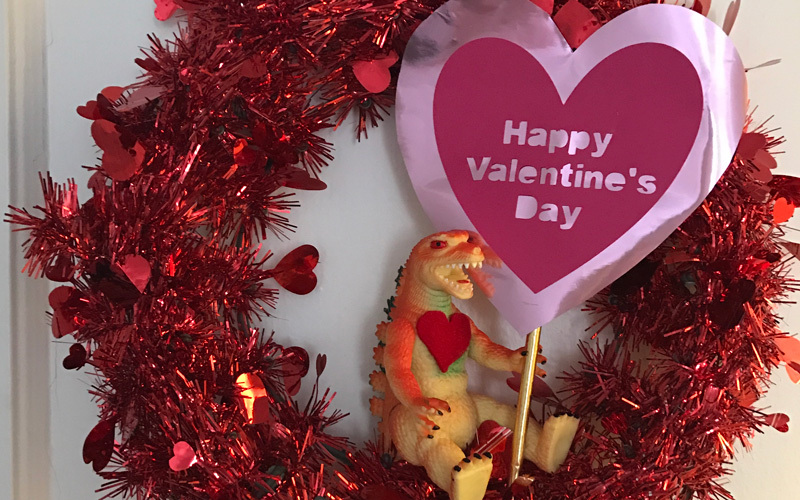 I added a goofy plastic dinosaur and a little heart note and put it on my neighbor’s door last year. It isn’t going to win any design awards and borders on tacky, but it is wacky and childish and fun – award winning in my book! Plant a succulent or mini plant in a recycled tin can and wrap with decorative paper. Give to a teacher, friend or anyone who you think needs a little nature in their life. Pay for the person in FRONT of you at the coffee shop. It’s a nice thing to do AND a much easier transaction than paying the person behind you. You know the total financial commitment going in (keep an open ear at the cashier) AND the person has already ordered, so they can’t refuse you. Nice Thing #6: Give Thanks! Thank the bus driver, train conductor, public servant or person of your choice. I try to remember to thank the bus driver. I don’t think people appreciate a good bus driver. Try to thank a person of service if you think of it. They may have a job for which they are paid, but it is always nice to feel appreciated. Nice Thing #7: Give a Buck! Leave one more dollar as a tip. I waited tables for a long time when I moved to New York. It always made my day when a customer would tip a little extra. Nice Thing #8: Post It! Put an “I Love You” Post it in your significant other’s wallet. I do this for my boyfriend once in a while. I know it makes him happy. Nice Thing #9: Mail A Card to Your Mom! 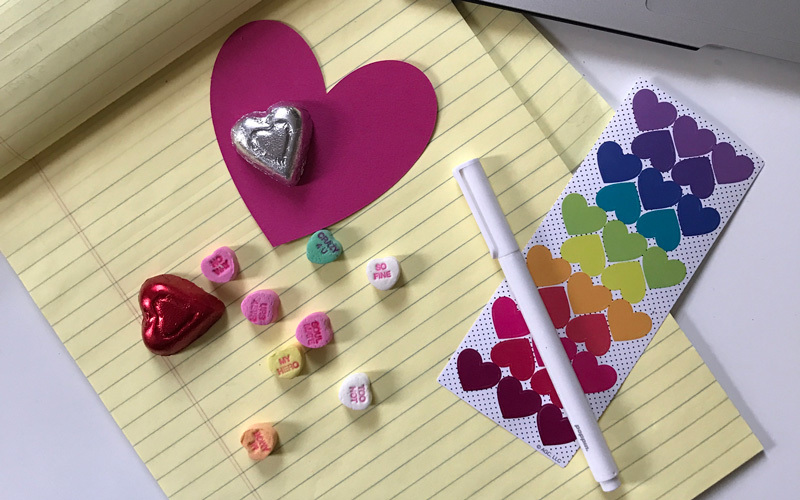 Mail a Valentine to your parents, grandparents and/or older relatives. You may already do this. If you do, GREAT! If you don’t, it will be a lovely surprise for them. You may get a reaction, you may not. But, I’ve noticed as people age, they are often very moved by the thought behind the gesture of a card. Nice Thing #10: Don’t Forget YOU! How often are you doing that? I’m definitely not doing it enough. It sounds arrogant, but you SHOULD love you! You ARE great! Now give yourself a hug! I want to wrap this up by saying that these Nice Things are mere suggestions. I’m not telling you that you SHOULD be doing all or any of these things. I gave you a big list so you’d have things from which to choose. I also don’t want to give the impression that I am running around New York paying for everyone and pinning hearts on strangers 365 days a year. I am polite throughout my day, but honestly, I spend a large portion of my existence hiding behind giant sunglasses listening to music and trying to drift anonymously from place to place. Well, enough with anonymity! This month, I’m going to make an honest effort to remove my Jackie-O’s, turn off my music and do some Nice Things! Are you with me?! Thank you so much for acknowledging how so many of us are feeling. These are great and easy ideas. So relieved I’m not alone! Thank you for you comment and for reading! I agree with you so much … what you wrote should fall on one’s heart monthly, and at least once a week… hey … love ya! You are great! I am an only child and have lived most of my life ‘hiding’. Thank you so much for your comment. It makes me so happy to hear that people like what I have to say. You all did a “nice thing” for me! Thank you for your comment and for reading the blog! I’m so glad you liked it! Blessings to YOU! So glad you liked it! This is a great article. If we all do a couple of these things we can make the world a better place – if only for that moment. Thank you for the inspiration! Thank you for your comment and for giving it a read! I’m so happy it spoke to you! Thanks for your comment AND your dog love!!! I appreciate you reading the blog! I LOVE being that person at work that is the morale booster. Teaching can have many rough days before seeing a good day, – but not with me in the building. I ‘m that burst of energy (really energized with the Morning Red Bull) that is there to say Good Morning , or just note or card saying how great those people are. But this year was awesome with my Cricut and Valentine’s Day and my self proclaimed title- School Cheerleader, at work. I made soooo many cards and boxes. Being gracious and generous is infectious and it can make a person’s day or just spread cheer. I grocery shop a lot for a family of 5 and it’s a regular habit of mine to let someone in front of me who only has a few items so they won’t have to wAit for me. Small Things and recognizing others.